Barracuda have two sets of razor-sharp teeth that can slice its prey into pieces. 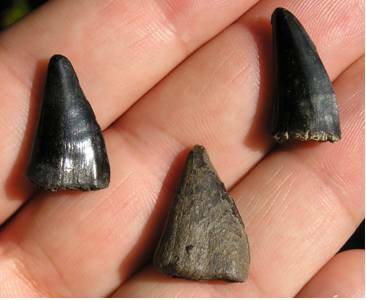 These dagger-like teeth can be found as fossils, on many Florida Beaches, in Miocene deposits of 8-10 Million Years old. It also can be discovered in Florida fossil deposits from as early as the Eocene Period to as late as the Pleistocene Period. They like to hang-out in near shore coral reefs, sea grasses and mangroves. They are at times a solitary hunter lying motionless one moment and blazing at speeds up to 27 mph (43 km/h) the next, to attack fish. Its long slender body gives it maneuverability among the coral. 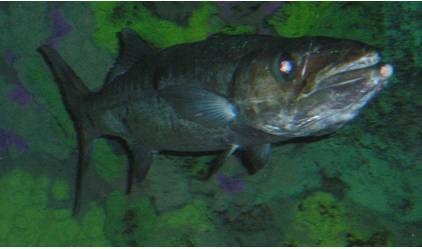 They have a large swim bladder that helps them maintain water depth balance. They have two separate dorsal fins and are found in tropical and subtropical salt waters. The modern record is 5.5ft (1.7M) and weighing 103lbs (44kg). It has an estimated lifespan of 14 years.